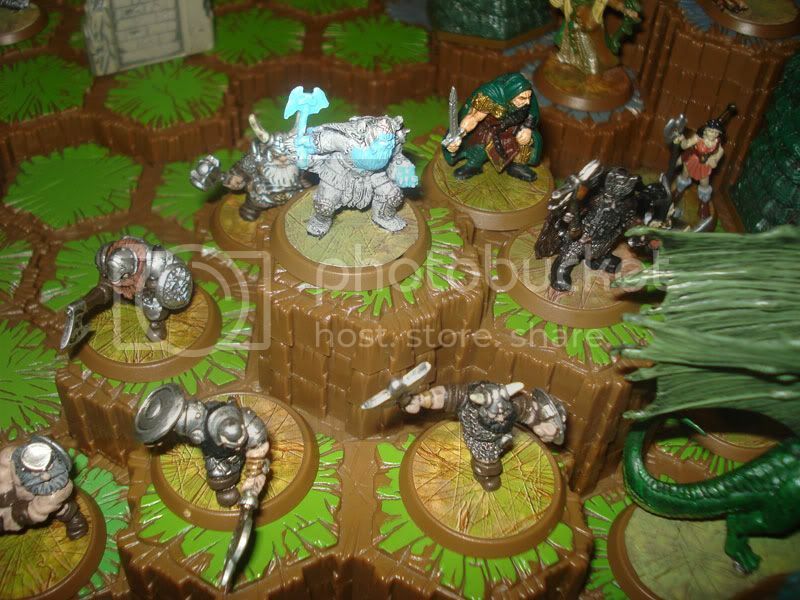 The main goal with these customs is to fill in gaps in already existing Heroscape themes and mechanics. I've created all heroes and no squads for three reasons. 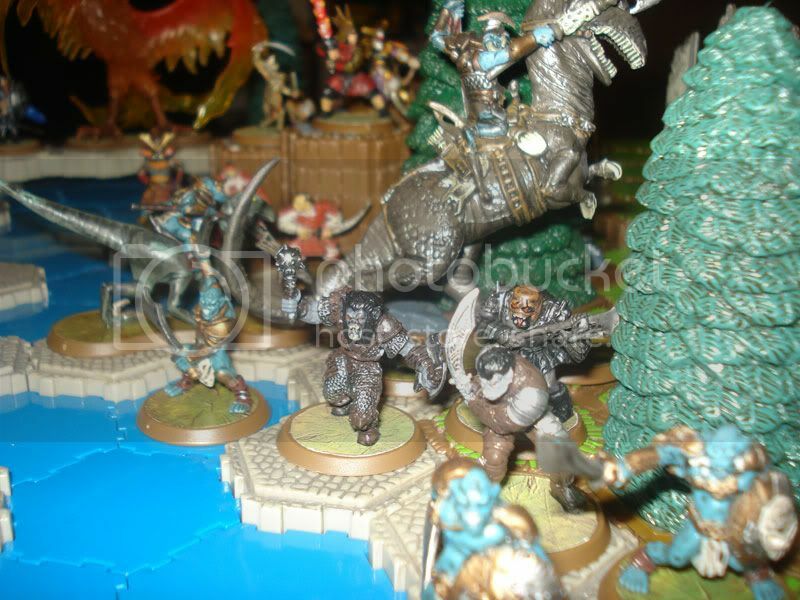 One, heroes are what give Heroscape flavor in my opinion. Two, they are much easier to do from the good D&D sculpts that are available. Three, it is much more cost effective. Common squads generally need between 2-5 sets of them with 2-4 figures each to make effective use in the game ($$$). No thanks, I'll wait for the officially released squads. Most of theses figures are readily available on Auggie's at the best prices you'll find on the interwebs. Thanks for looking. Please leave some feedback, especially if you've taken the time to play test a unit. I haven't updated this thread in awhile so I thought I'd preview one of the 4-5 units I'm working on. This guy I wanted to make as a hero bonding option for the Death Knights of Valkrill. He gives a nice boost to them and also one of my favorite squads for the D&D stuff so far, Phantom Knights. He would probably be best used early in the game because he'll keep coming back after being destroyed. Similar to Thanos, but you have 50% chance each round to bring him back instead of a 10% chance every turn. I developed these 2 heroes in tandem to work together as an aggressive 2 man hit squad. The bonding would work similar to wyrmlings, except they would bond exclusively with the other unique hero. In addition, they'd offer great flexibility because after one of them gets taken out, they're still Orc Champions and you can switch your Order Markers over to your Orc squads to bond with the remaining hero. I love the Orcs and so I'm really excited to try them out. 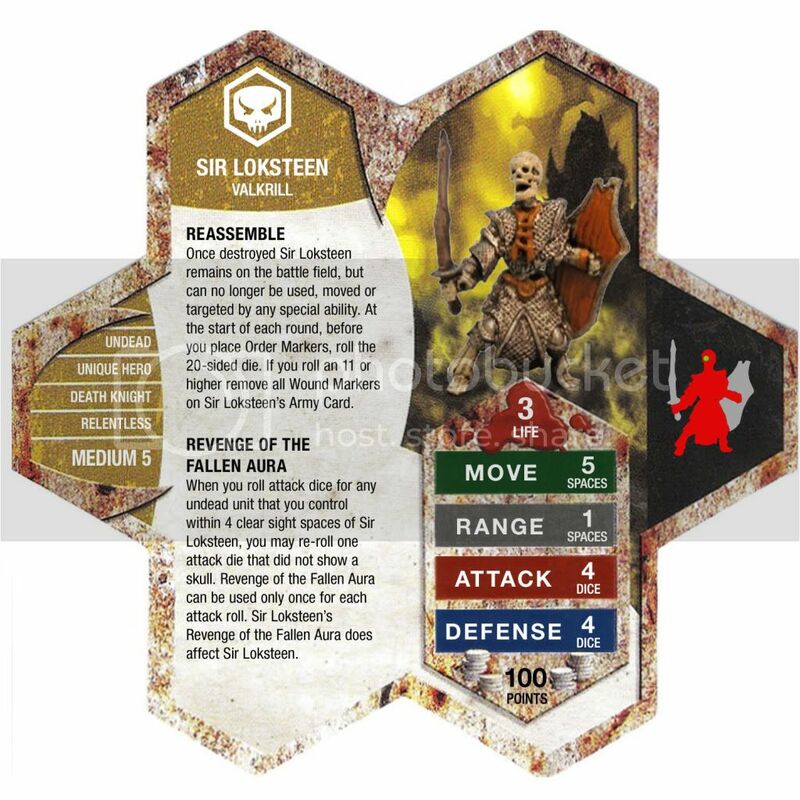 This guy is from the new D&D Lord of Madness set. He looks like a beefed up Arrow Grut, so I gave him stats to match. Left him as an Orc Archer so he can get the potential for some huge attacks when next to Swog Riders. The photo of him on the card is blown up pretty bad. I'll for sure take a picture of it once I order the figure. I'm debating changing his special to a "Knockback" type ability or "Crippling Shot Special Attack" to disable a figure's move. I think the Drow are really cool figures and have fun abilities. They just need a good hero to rally around, so why not a dragon? 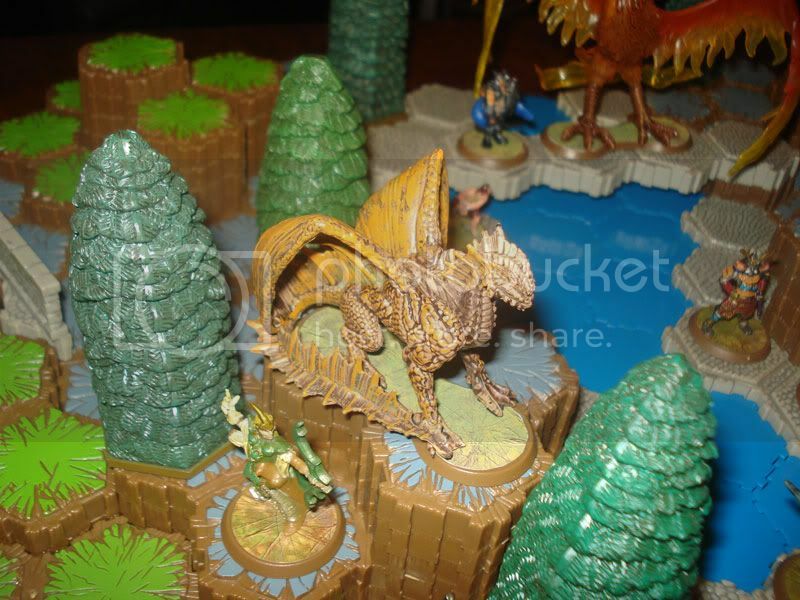 This figure is quite a bit smaller than the other Othkurik size dragons. I'm debating whether or not to make him Medium, but that would mean he wouldn't be able to be used with the Greenscale Warriors. He fits nicely on a DW9K base with just the front leg hanging over a touch. The Zombie Hulk looks pretty freaky. I gave my 2 zombie squads I had to my brother, so I made this guy for him to try out. He started out as a unique hero (original), but after some back and forth with dok I realized uncommon was definitely the way to go for the sake of mechanics and tweaked his powers after seeing some changes dok had made on his version here. 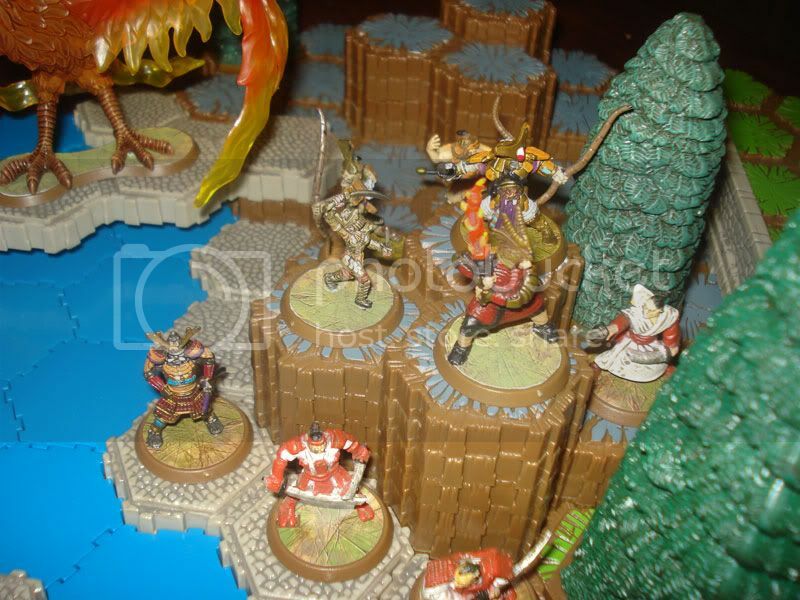 Was featured on the home page for Week @ Heroscapers 9/20/10 post here. When I saw this guy he looked like he fit the roll of an Utgar fanboy who would tag along with the heroes doing the heavy lifting. Kind of like a reverse Ana Karithon. I'd hate to go up against a Fen Hydra, Deathwalker or Krug with this guy sitting behind them. Love the sculpt for this guy. I'm not sure if he's worth an Order Marker or not as a filler unit as is. I'll have to play test him to see if he's going to need tweaking. When speculating over the D3 figures the name 'Evar Scarcarver' made me think of a dwarf. 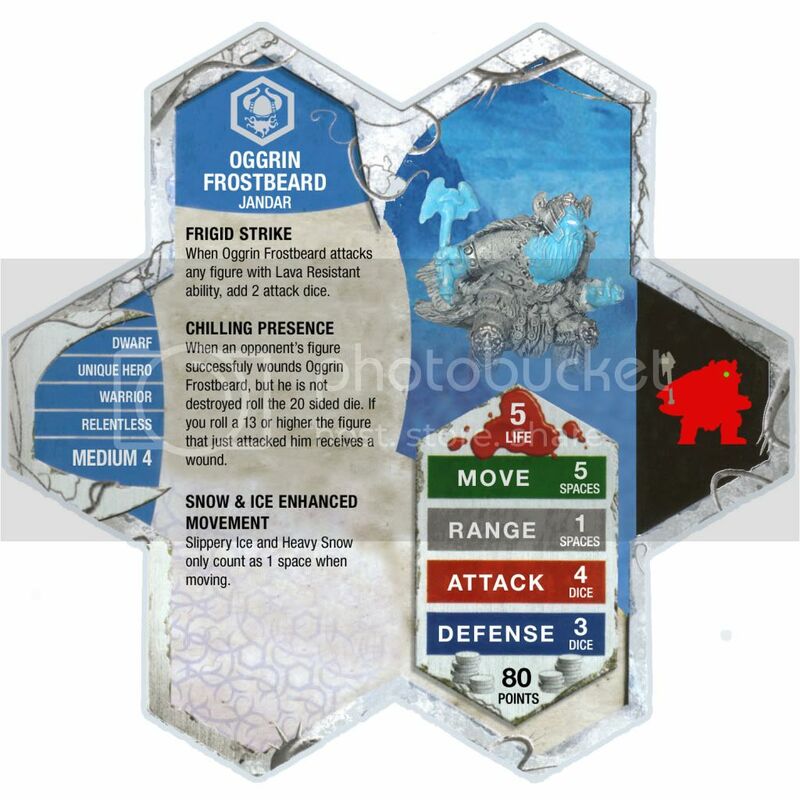 Then when I read the D&D card for the Frost Dwarf I thought it could make a good counter draft to fight against Lava Resistant heroes and while bonding with one of my favorite squads, the Axegrinders. This guy provides you with a means to keep Treasure Glyphs safe for when you can grab them for yourself. A fun thematic unit with some appropriate abilities to match the sculpt. 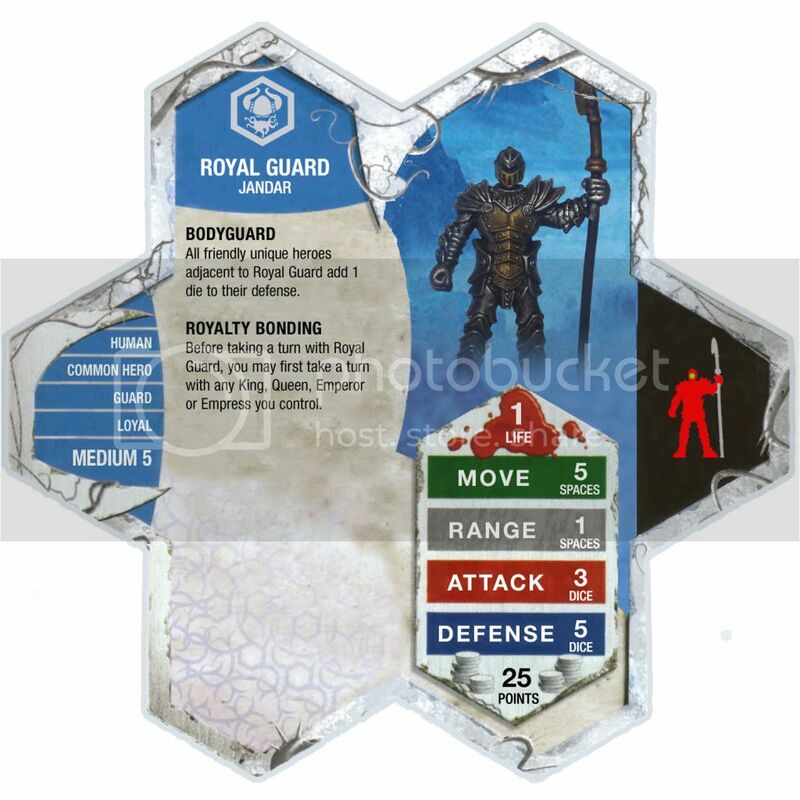 Also, he is so tiny your opponent is bound to forget about him, especially when he's hidden behind a wall, tree or rock outcrop. This figure is one my brother has been tinkering with. The other day I thought it would be really cool to see a Tornado rip through the board. I'm hoping the Path of Destruction ability isn't overly complicated. My first common hero custom. This guy is pretty self explanatory. He'd give you another option for dragon bonding and a handful of other figures like Sudema. This custom is one I decided to do after seeing Aquamaniac's Green Dragon. I really liked the idea for the Chlorine Gas affect, but using markers seems too complicated of a power. I decided to go with a modified version of Retiarus' Net where it makes it so small, medium figures only get to roll one defense die. 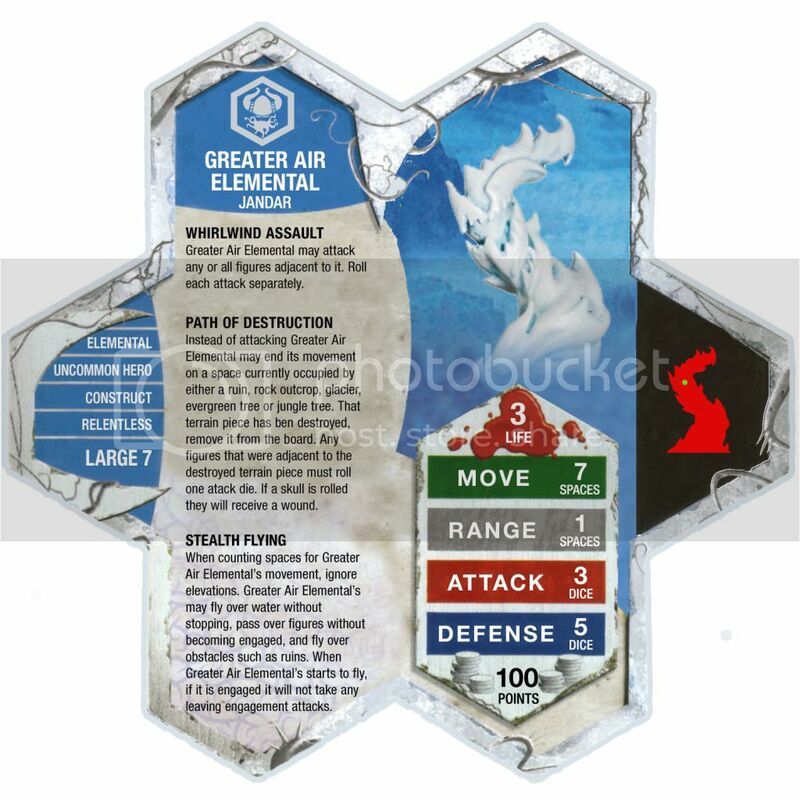 To make him a big pain I paired him with a defensive ability similar to Sentinels of Jandar against ranged attacks. This one was developed around the idea that the elves could really use some extra muscle in their ranks. While I'm at it, why not not beef up the Warriors of Ashra a touch. Full bonding would be too much I think, but movement bonding could be just what they need to get to their target and make use of their Defensive Agility power. The Warriors of Ashra and him would work probably alternate Order Markers to make the best use of both. 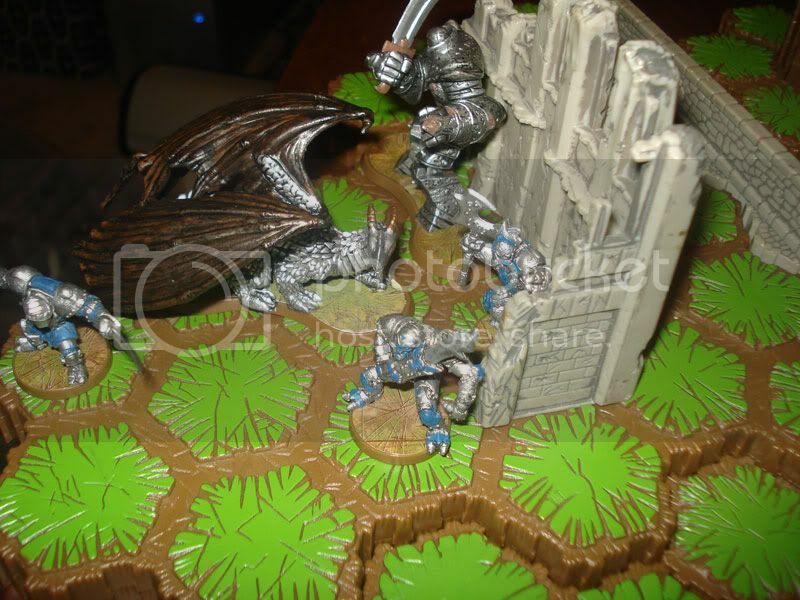 This figure for this custom was found by 1moreheroscaper. It isn't a D&D figure, but the quality of it matches any of the best in either classic or D&D in my opinion. 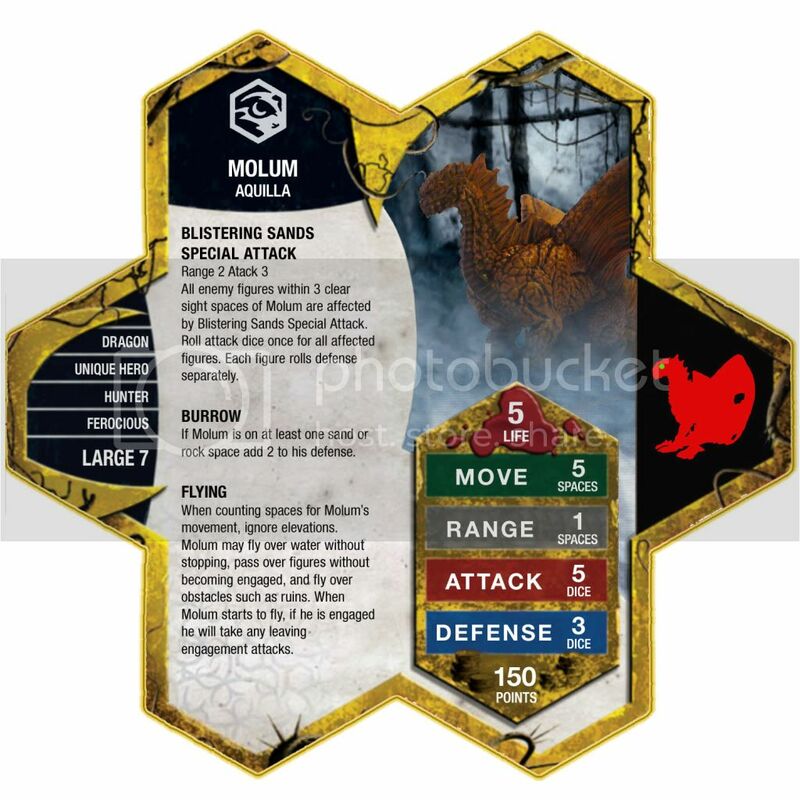 I wanted to give the Phoenix a healing power and attack move. This is the first version of probably many. She has a blast area special attack with Acolarh type healing aura. Moved her points down to 210. This figure is much cooler than I expected it to be. I wanted to give him some dragon based powers and give him a boost to the Izumi Squad to get them back in the game with a fun Samurai themed army. He would also be considered the first melee samurai hero. His special right now is just Guri-Oni's with one extra attack. Like to come up with something more original. Was having a difficult time coming up with something original for her. I finally decided on 2 abilities that would work together nicely to give her some deadly potential. Here is the first custom I created. Didn't give him any breath attacks, although Iron Dragons are supposed to have lighting breath and shields, but rather focused on his solid iron defense and attack. Thought he'd make a great counter against other dragons and Vydar range (Q9 & Q10's nemesis) with his Ricochet ability. There is supposed to be a blue dragon coming for Aquilla eventually, but this brown dragon looked like it would fit pretty well also. I'll have to test out his special to see if it's too good. 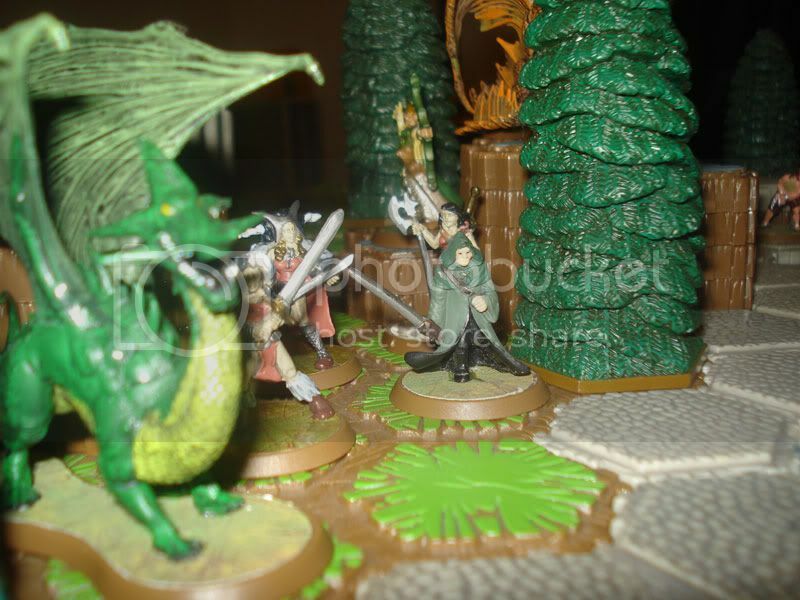 Was going to make it affect all figures, but then he'd never see any play with the Greenscales. The figure for him is definitely one of the best ones from D&D. As soon as I get the figure for him in the mail along with my D3 pre-order I'll update his card with a much better photo. Another figure from the Lord of Madness D&D set. Just got this thing in the mail. It should fit on a double spaced base going the long way. It's insanely cool looking, detailed, and bigger than I expected it to be. The range and attack are insane, but it takes 2 turns to use. 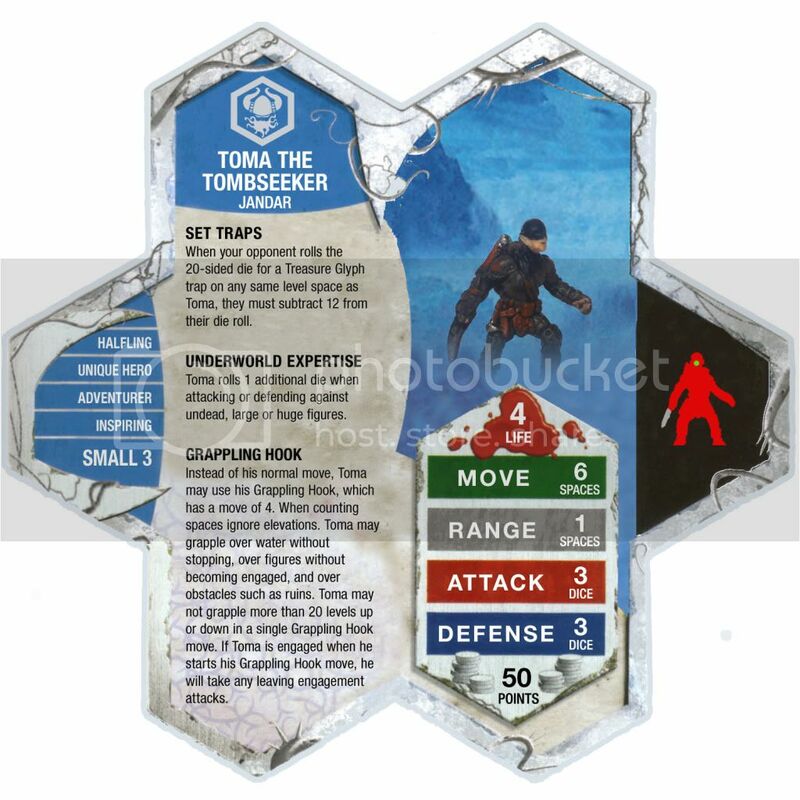 My idea was to put one of these in the middle of the board and have both teams rush to use it. 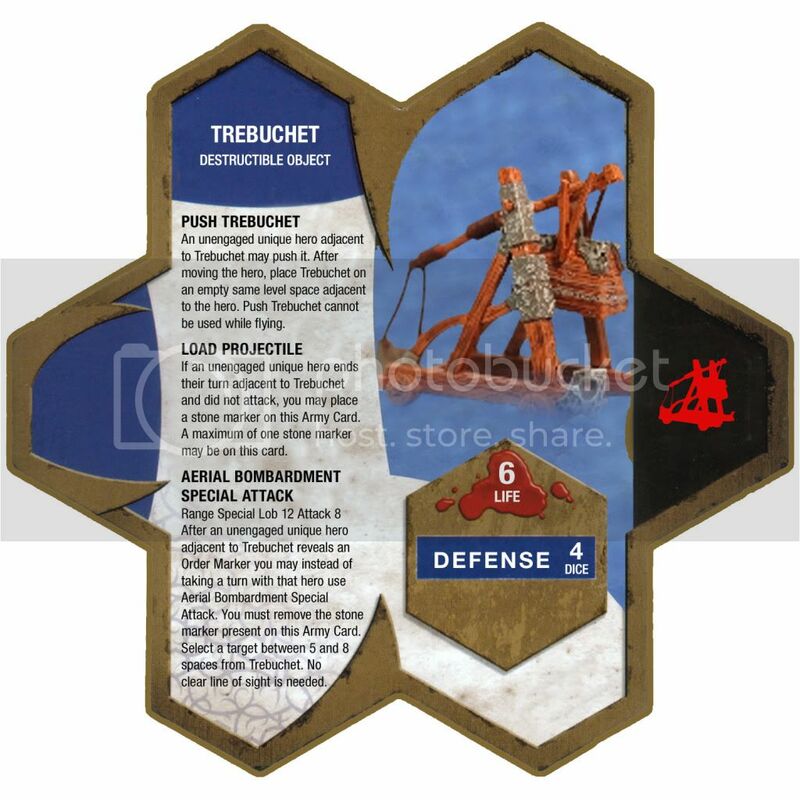 The one weakness the Trebuchet has, other than taking 2 turns to use, is that it can only target figures at least 5 spaces away. I'm considering whether to change the special attack to "Flaming Pitch" and make it hit every figure adjacent to the target, but then I'd have to lower the attack some. The Zombie Hulk looks pretty freaky. I gave my 2 zombie squads I had to my brother, so I made this guy for him to try out. "Abomination" is a freaking stroke of genius - just the perfect power to help the zombies out in the currently evolving metagame. My only complaint is that I think it makes more sense if we make the zombie hulk an uncommon figure. I worry that paralyzing fear is actually too strong. ZRA is a pretty awesome power, and anything that boosts the attack potential of zombies needs to be very carefully balanced to account for that. A similar idea would be making an aura bonus that only applies when attacking/defending against undead, but that's probably too metagamey. I like Horde Shriek. Alternatively, you could set up some sort of interaction along the lines of the MRT's war cry, or maybe the reverse of the war cry (if the zombie hulk does not attack and ends the turn unengaged, you get a turn with the zombies). I'm just spitballing here, though - what you have is fine. I think I might make my own blatant ripoff of what you've done here, if you don't mind. You've got my creative juices going. Nice work! Thanks! That was my original idea for creating the custom. I worry that paralyzing fear is actually too strong. ZRA is a pretty awesome power, and anything that boosts the attack potential of zombies needs to be very carefully balanced to account for that. I chose -1 defense because it isn't as good of a buff as +1 attack and it fits thematically. The aura is cool because it would draw a lot of fire from the zombies to the hero and then work well with Abomination to give him the opportunity to come back again once killed. Do you think his cost is accurate? Should it change if he was made uncommon instead of unique? Right on. If you want to buy the figure he's on Auggie's for $2.79. I've been looking at some cool/cheap D&D figures on Auggie's recently and I finally bit the bullet and purchased them to make customs out of. A lot of ideas have already been sketched out, but here is my first official looking completed custom. The Iron Dragon Prowler now fights for Vydar. 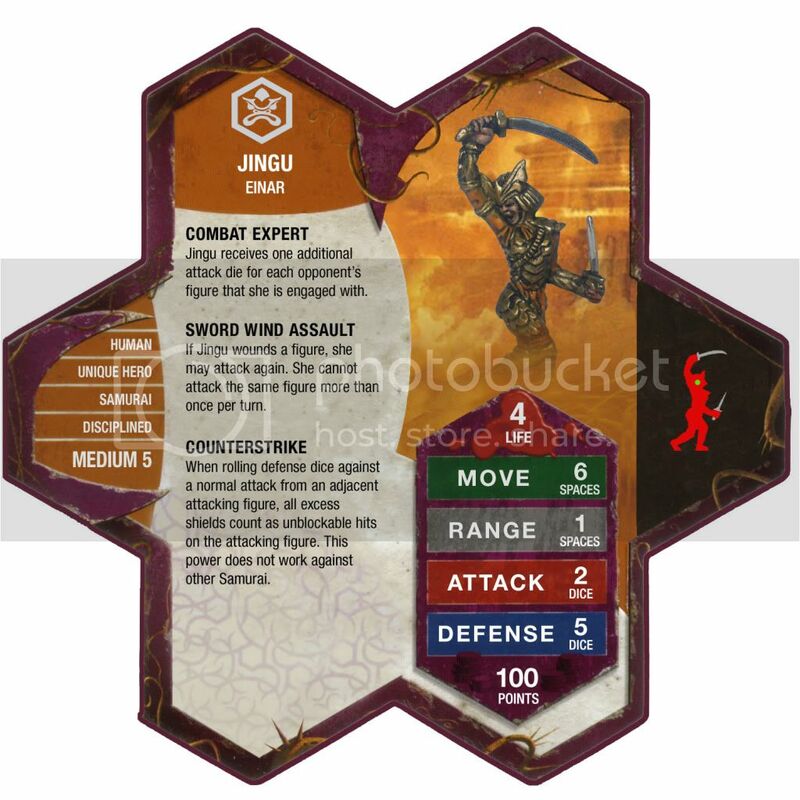 Didn't give him any breath attacks, although they are supposed to have lighting breath and shields, but rather focused on his solid iron defense and attack. 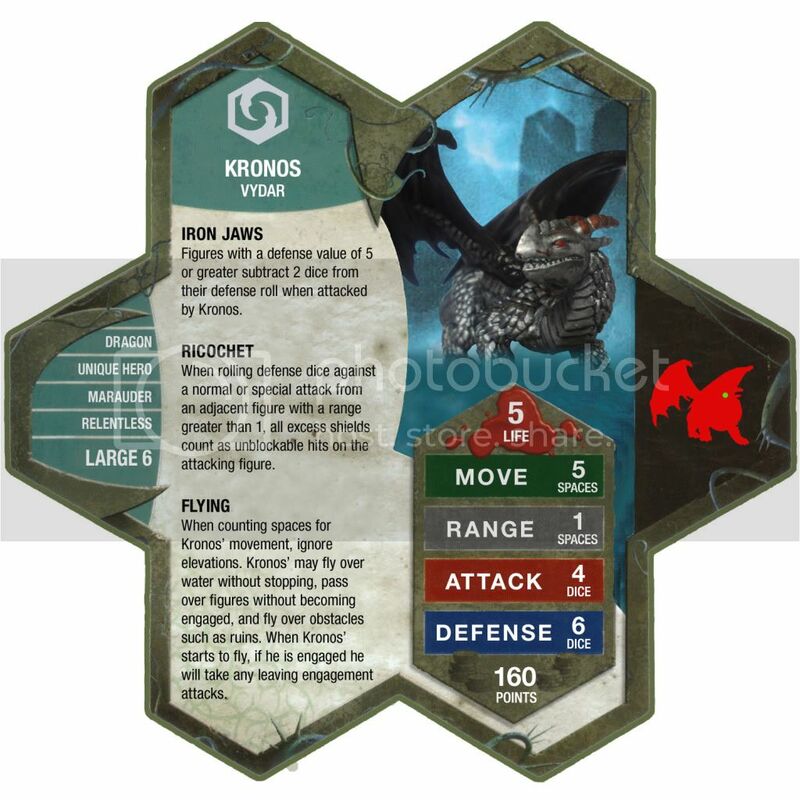 Thought he'd make a great counter against other dragons and Vydar range (Q9 & Q10's nemesis) with his Ricochet ability. 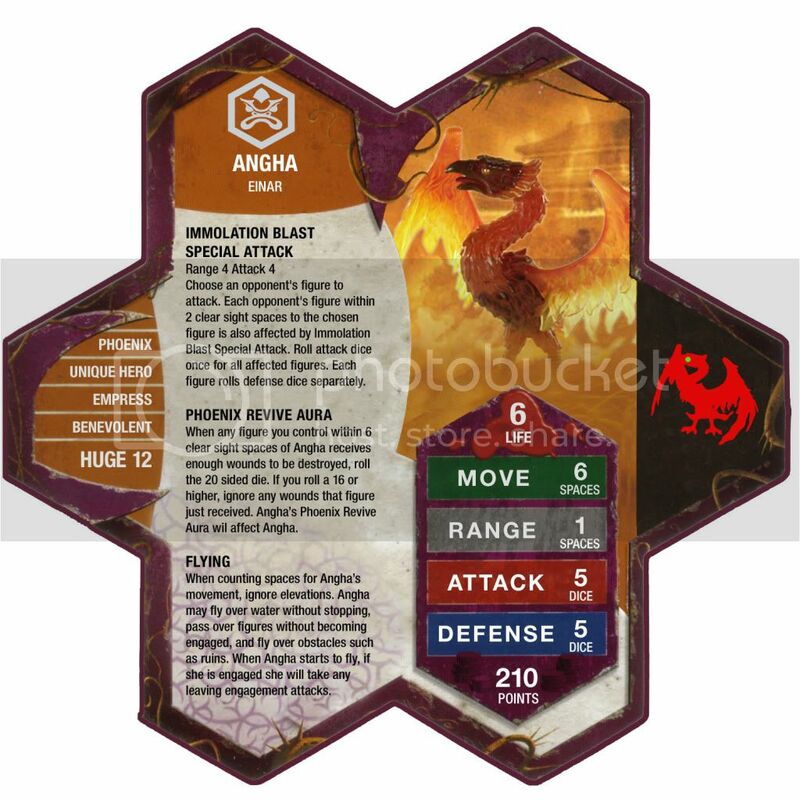 There is supposed to be a blue dragon coming for Aquilla eventually, but this brown dragon looked like it would fit pretty well also. I'll have to test out his special to see if it's too good. Was going to make it affect all figures, but then he'd never see any play with the Greenscales. I think the Drow are really cool figures and have fun abilities. They just need a good hero to rally around. Why not a dragon? Thanks a lot! If you play test any of these and find the points way off please let me know. Last edited by Good Pig; September 21st, 2010 at 07:42 PM. I like the drawing attention thing, and I agree that it's great thematically. I just worry that it's too powerful. I'd have to test it before I'd be comfortable with that power. Uncommon definitely adds to the utility of the "Abomination" power - I think the figure needs to be more expensive to make that work. I think I'm going to make a weaker (but very similar, overall) uncommon version. I'll let you know when I post it. ETA: how big is the base on this figure? 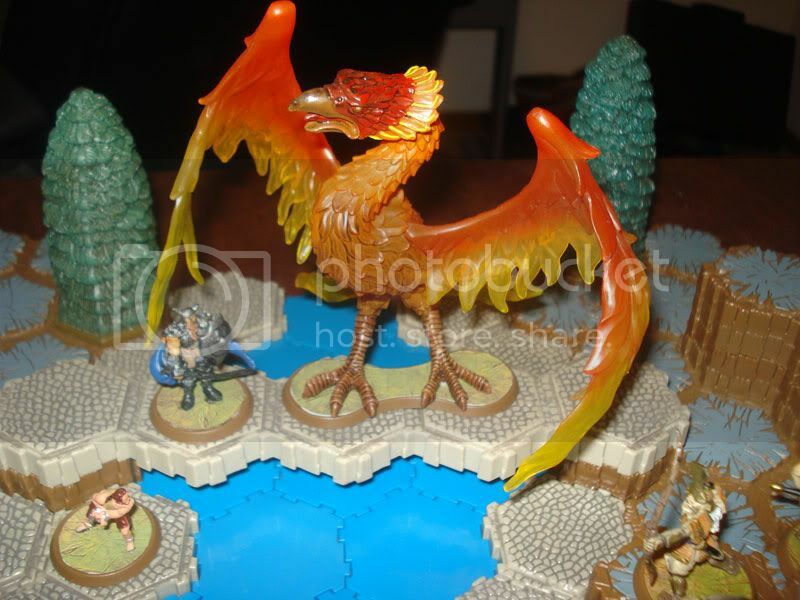 Can it fit on a hex, or would it have to get rebased onto a double-hex base? How does the length from toe to toe on this figure compare to DW9k? Last edited by dok; September 17th, 2010 at 06:53 PM. Yeah, I was thinking about this one today and I think I'll change it up to an uncommon as well and rework his power to get him in the mix in the early game. Also I'll make him more flexible to work with more undead units and multiples of his uncommon. I'll rework the photoshop file once I'm home. 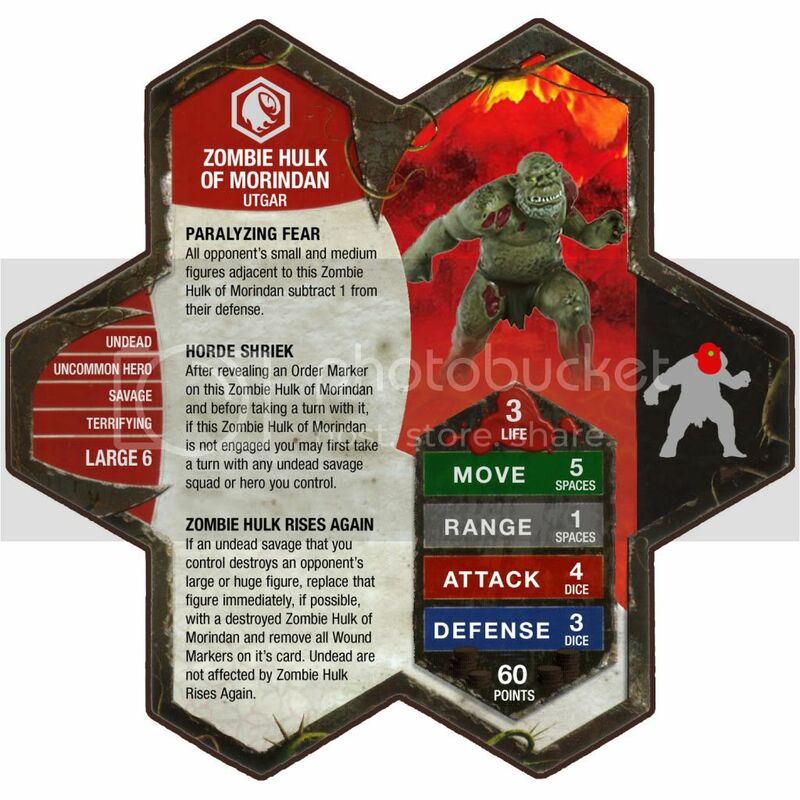 After revealing an order marker on this Zombie Hulk of Morindan, and before taking a turn with him you may take a turn with another Zombie Hulk of Morindan you control or any undead squad you control within 6 clear sight spaces. I upped his points to 70. Can't say for sure what it should be without testing him. Basically I think there are two ways I could go with this guy. Lose fear aura, but give him full turn bonding with either another Zombie Hulk or zombies (or any undead squad). Only thing I'm worried about with him is turning him into another Khosumet. Nice thing about being uncommon is he could help bring back another one of his uncommon brothers. I'm actually not sure I don't have him and haven't seen a picture online with any sort of scale comparison. I put together this custom for my brother (Cyberclaw16). I may order one or two though. Here's my version. I was thinking along very similar lines to you, obviously. I kept the points at 60 but dropped it to 3 wounds (same points/wound as the zombies themselves). It's quite close to your option B, although it's not quite full bonding. I wanted to avoid chain bonding via Ornak, and I also wanted to make it hard to consistently get 4 attacks in a turn. I like the idea of allowing him to activate another Zombie Hulk in stead. Thematically, I sort of like just staying with zombies, though, as opposed to opening it up to undead squads in general. Plus, if you allow Death Knight bonding, it's chain bonding again (although you could restrict it to Utgar, I suppose). Yeah, I've talked myself into it - I'm going to edit it now to allow the Zombie Hulk to activate another Zombie Hulk with that power. Yeah, it definitely needs testing. The way I have it worded, there's room on the card for a third power of some sort if it's needed. 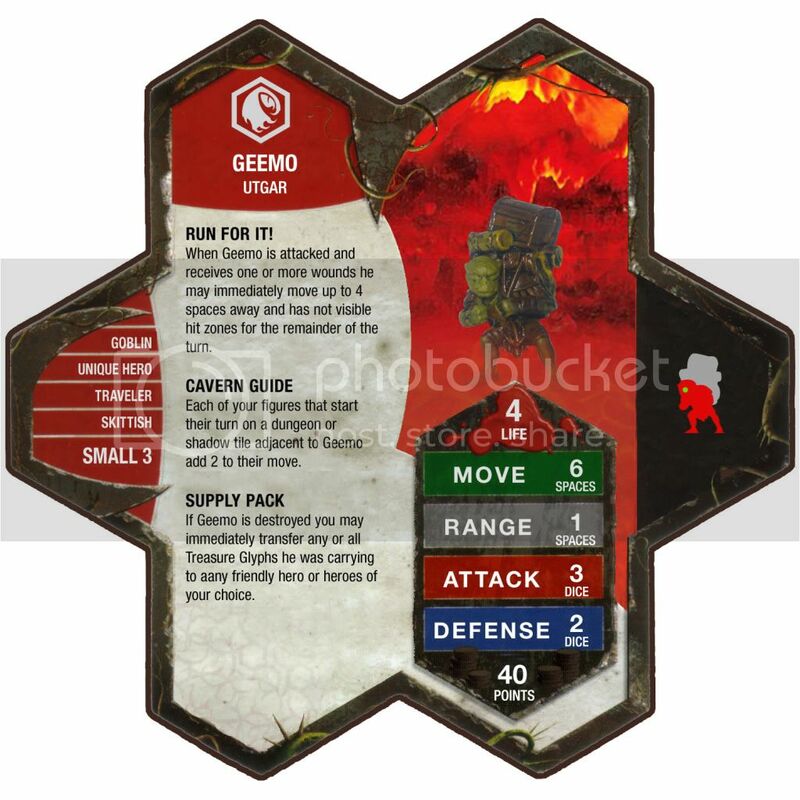 There's tons and tons of good options - some sort of zombie slam special attack, fear aura, adjacency-only fear aura, bonus to adjacent zombies... I could keep going. Yep, that part is nice. You also have the chance against an opponent with lots of large figures to send your ZHs forward and then just let them soak up wounds, and then the Zombies of Morindan can bring them back later. A horde of ZHs would be cool in a hero-only format, too. Ah, OK. I've played your brother at a tournament in Boulder, by the way. Added a new custom: Sevvicus for Utgar. Probably organize these by general once there are enough of them. Servicus would have good Synergy with Ornak and/or Hydrae. Cool custom. Thanks. I figured that he'd force your opponent to kill him first, much like how Raelin is used in the game. Besides Hydra/Ornak, another great use for him could be camping behind Krug. Wait til Krug has soaked up 7 wounds then use the A Sacrifice To Utgar power to keep him alive while getting his 2 attacks of 9. I just opened up my shipment from Auggie's this morning and he looks even better in person. Are you ready for a screeching U-Turn? After playtesting my version, I found that the zombie shriek, as I worded it, gives very little value once the hulks are all in position. You really want your turns on the zombies themselves, so once the Hulks are engaged you don't want OMs on them any more. That was sort of the point, because I think a consistent 4 attacks per turn would be too powerful for the zombies, but the way I wrote it it's too easy to just engage the hulks and ignore them. I didn't want consistent 4 attacks/turn, but I didn't want the hulks to get completely shut down, either. So... given the way my pseudo-bonding power draws opposing figures into adjacency, I think the zombie hulk does need to have some passive power to hurt adjacent figures. So... I'm going to run a test with the powers exactly as I had them on my version, plus paralyzing fear that only works on figures engaged to the hulks. I think this could work pretty well.